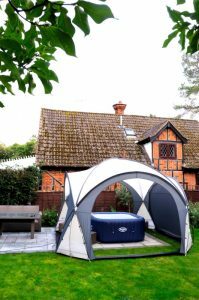 WickedTubs are based in Hemel Hempstead and specialise in the hire of high quality Lay-Z-Spa hot tubs. Perfect for both hot Summers and cold Winters, we set-up the tub, leaving you to enjoy the relaxing, warm bubbles. We set-up the tub (and dome if required), with a complimentary bottle of Prosecco. Once the tub is chlorinated and tested, you’ll need to allow approx. 24 hours before it is ready for use (to allow for heating time etc.). After you’ve finished, we empty the tub using a high power pump and remove.